A term-by-term exposition of the Court and its major decisions are explored as factors in the course of history. 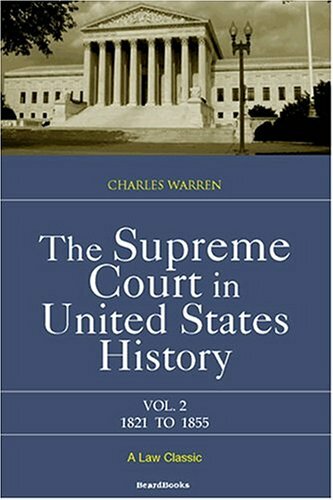 Lawyers, historians, and laymen will enjoy reading this exposition of the Court and its decisions as living elements and important factors in the course of the history of the United States. The Court is described term-by-term so that its decisions can be correlated to political events. Views of important cases by then contemporary writers and statesmen are stressed to set the impression made on the public which, according to the author, often has had as great an effect on history as the decisions themselves. The important role that public opinion attacks upon the Court have played is emphasized. Charles Warren was born in Boston, Massachusetts on March 9, 1869 to Hon. Winslow and Mary Lincoln. He received his A.B. from Harvard University in 1889, and his LL.D from Columbia University in 1933. He was admitted to bar in 1892 and practiced at Boston. He became a private secretary to Gov. William E. Russell in 1893; Associate in Gov. Russell's law practice until Russell's death in 1896. He then became a senior member of Warren and Perry, Boston (1897-1914); chairman of the Civil Service Commission (1905-11); assistant attorney general of the United States, Washington (1914-18). He was appointed special master by U.S. Supreme Court in case of New Mexico vs. Texas in 1924, and a lot of such cases. Academically, he was Stafford Little lecturer in Princeton (1924), University of Rochester Cutler lecturer on Constitution (1927), Boston University Law School Bacon Lecturer on Constitution (1928); James Schouler lecturer on history, John Hopkins (1928); William H. White lecturer on jurisprudence, University of Virginia (1932); Julius Rosenthal Foundation lecturer on law, Northwestern University Law School (1934); Norman Wilt Harris lecturer on neutrality, University of Chicago (1936); Frank Irvine lecturer, Cornell University (1937); Cutler lecturer on Constitution, College of William and Mary (1940).